Yesterday my bunny terrace was completed with success. The size is 10X2X2 feet. It accommodate 5 cells with average size of 2X2X2 feet. I put all my 3 bunnies into room number 1. They seem to like their new room. They hop, they jump and they chase each other. 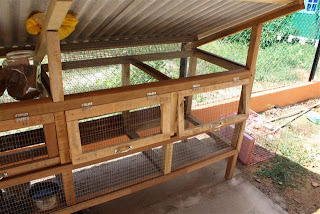 This afternoon I make a visit to one of Terengganu local pet shop, Ming Yu Two. After asking to one of the worker, she take me to the bunny section. I see lots of local bunnies age between 2 month to a year old. Then something caught my eyes. 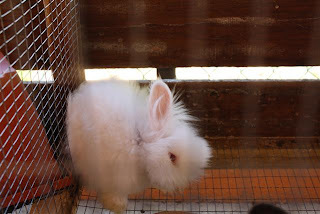 A white bunny sitting alone in a cage. A very furry one. Looking at the price tag, I'm shocked. RM180.00 for a single bunny ? This is a must have species. 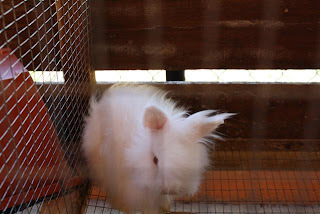 A Lionhead buck with a satin white fur. Without thinking more, I bought the bunny and also a mate for it. I choose a Grey local doe and put immediately inside the Lionhead's cage. Without a moment to loose, the buck immediately started the mating ritual. The Tokey saids that the Lionhead is already "puasa" for too long. I hope that the mating is a success and hope to get some crossed-breed litter soon. this couple will be renting Room 2, next to my teenage bunnies. This is Jack, my English Buck. After a few days alone, Kelabu finally get 2 new companions ( maybe on 20th July, I think ). One is called Putih and the other one called Brownie. At the age of less than 2 months old, I'm not yet unable to determine the sexes of my new addition. They need no introduction. Once inside the cage, all of them are sniffing happily together. I'm using a cage with the dimension of 2X5X2 feet divided into 2 cells. One is filled with my bunnies ( now they are three AGAIN! ) and the other cell occupied by 5 'Giant Chicken'. I think the bunnies must be moved to better environment. 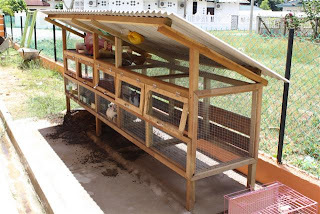 Maybe tomorrow I'll asked one of my friend to built a new house for the bunnies. In the month of July, Friday...( forgot the exact date ) I've decided to keep bunny for pet. It's a mix decision between cats or bunnies. Since the cat sometimes can be a bit messy with their poops, I've decided to take the bunnies ( they also makes a good cuisine ). At first my lovely daughters were against it, but after a short while they were fond of it. I start with 3 bunnies. But a after a week and everyday attacks by stray cats, only one survive. It left me with a grey buck ( we name it Kelabu ). The unlucky two were black/white and plain white does. After burying their remaining carcass, I made an upgrade to the cage. lifting it 1.5 feet off the ground and refitted the floor with 0.5X0.5 inch BRC making the cat unable to grab the bunny's feet. Now it's all okay and I've never seen the cats since then.